I have subscribed to Terence Tao’s blog. for . Try this yourself and surf to his post to see the “slick, 3 line proof”. But that really isn’t the point of this post. But I see that even the smartest, most accomplished among us can delight in the fun, simple things. Side note: I haven’t published much on this blog lately, mostly because I’ve been busy updating this one. It is a blog giving notes for my undergraduate topology class. That class was time consuming, but I had the teaching time of my life. I hope that my students enjoyed it too. I am always looking for interesting calculus problems to demonstrate various concepts and perhaps generate some interest in pure mathematics. And yes, I like to “blow off some steam” by spending some time having some non-technical mathematical fun with elementary mathematics. 1. Integration by parts and basic reduction formulas. 3. Calculation of volumes (and hyper volumes) by the method of cross sections. 5. Elementary arithmetic involving factorials. We will assume that the usual tools of calculus work as advertised. Start. If we done the (hyper)volume of the k-ball by we will start with the assumption that ; that is, the distance between the endpoints of is . Step 1: we show, via induction, that where is a constant and is the radius. Our proof will be inefficient for instructional purposes. We know that hence the induction hypothesis holds for the first case and . We now go to show the second case because, for the beginner, the technique will be easier to follow further along if we do the case. Yes, I know that you know that and you’ve seen many demonstrations of this fact. 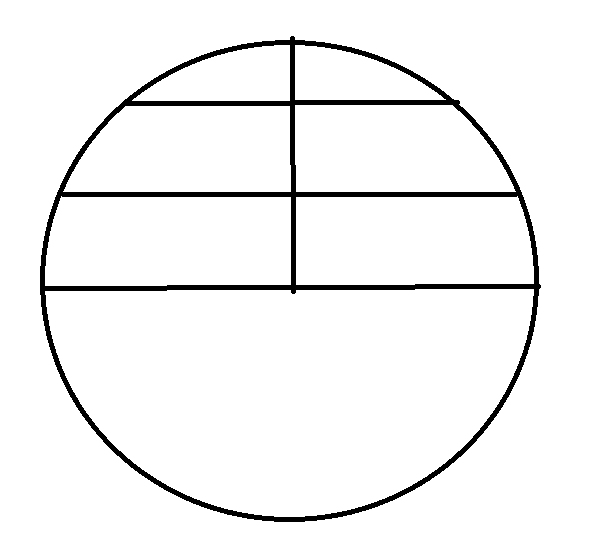 Here is another: let’s calculate this using the method of “area by cross sections”. Here is with some cross sections drawn in. Now do the calculation by integrals: we will use symmetry and only do the upper half and multiply our result by 2. At each level, call the radius from the center line to the circle so the total length of the “y is constant” level is and we “multiply by thickness “dy” to obtain . Yes, I know that this is an easy integral to solve, but I first presented the result this way in order to make a point. Exercise for those seeing this for the first time: compute and by using the above methods. which is what we needed to show. which is the required formula. Note the following: . If this seems strange at first, think of it this way: imagine the n-ball being “inscribed” in an n-cube which has hyper volume . Then consider the ratio ; that is, the n-ball holds a smaller and smaller percentage of the hyper volume of the n-cube that it is inscribed in; note the corresponds to the number of corners in the n-cube. One might see that the rounding gets more severe as the number of dimensions increases. One also notes that for fixed radius R, as well. There are other interesting aspects to this limit: for what dimension does the maximum hypervolume occur? As you might expect: this depends on the radius involved; a quick glance at the hyper volume formulas will show why. For more on this topic, including an interesting discussion on this limit itself, see Dave Richardson’s blog Division by Zero. Note: his approach to finding the hyper volume formula is also elementary but uses polar coordinate integration as opposed to the method of cross sections. When I was in grade school, I was evaluated by people with undergraduate degrees. When I was in high school, I was evaluated by people with undergraduate degrees, and occasionally by someone with a masters degree. When I was an undergraduate, I was evaluated by Ph. D. holders and an occasional masters degree holder. When I was a graduate student, Ph. D’s with impressive research credentials evaluated me. In all honesty, at least my department does “peer classroom visits” at least with non-tenured faculty, and on occasion, with some tenured faculty (the latter is mostly voluntary). Hitting the bat with the ball….the vector calculus integral theorems…. When I was a small kid, my dad would play baseball with me. He’d pitch the ball and try to hit my bat with the ball so I could think I was actually hitting the ball. Well, fast forward 50 years to my vector calculus final exam; we are covering the “big integral” theorems. And so I am giving them classical Green’s Theorem, Stokes’ Theorem and Divergence Theorem problems….and everything in sight basically boils down to integrating a constant over a rectangle, box, sphere, ball or disk.